The volume sees a return to form for the series. If you can get past the bug-eyes then this will be approaching the greatness of the first two volumes. You have the fallout from the cliff-hanger last book, the photo-shoot, the ballgame and Cleo being Cleo. And if you thought the last ending was dramatic wait till you see this one. The art is on top form and Campbell seems to be in love with his new found nocturnal skills as there are a lot more night scenes. 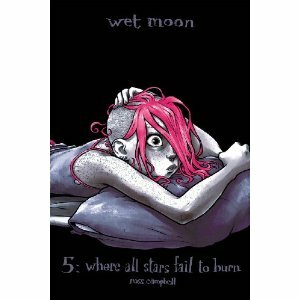 There is one supernatural/ dream sequence that is really creepy and a dramatic action sequence that has you on the edge of your seat, and frantically ordering volume six. There is also quite a lot of fan art of the characters reproduced at the end of the book. It is a great volume overall and makes you think about some weighty but often overlooked issues. A solid Thumbs Up! This entry was posted in Graphic Novel and tagged Ross Campbell, Thumbs Up! by 365gn. Bookmark the permalink.